In 1963, Freund became the first photographer to display work in the National Portrait Gallery as part of the exhibition, "Le portrait francais au xxe siecle [French portraiture in the 20th Century]," at the Bibliothèque Nationale de France in Paris. Freund had not only photographed some of greatest artists of the 20th century, her work also spoke to a time when there was great artistic collaboration between England and France in 1930s Paris. After the exhibition in Paris, Freund was invited to London to give a talk about the Anglo-French artistic scene of 1930s Paris. Her work was well-received by the English press, and she was approached by publishers to do a photographic book about her time in Paris. 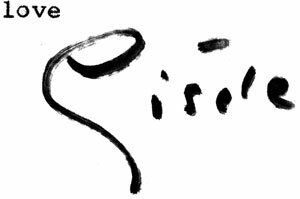 Cyril Connolly, the great English author, editor, and critic, agreed to write the Preface to the book (he pulled out at the last minute and was replaced by Simone de Beauvoir). The University of Victoria houses Freund’s personal collection of material relating to making of James Joyce in Paris: His Final Years, beginning with the London exhibition. The collection includes her copy of the program from this exhibition, as well as her handwritten lecture notes. André Malraux played an important part in Freund's career. In 1933, he won the prestigious Prix Goncourt for his novel, La Condition humaine. He needed an author's photo, so Freund took him up to the rooftops of Paris where she captured these famous photographs of Malraux smoking a cigarette and being buffeted by wind. 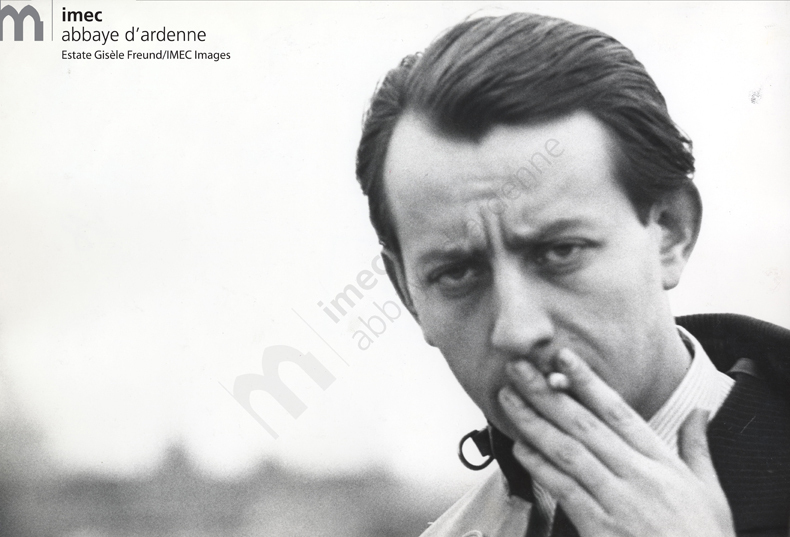 These photographs would be used to create a commemorative postal stamp of Malraux (with the cigarette airbrushed out, of course) in the 1980s. 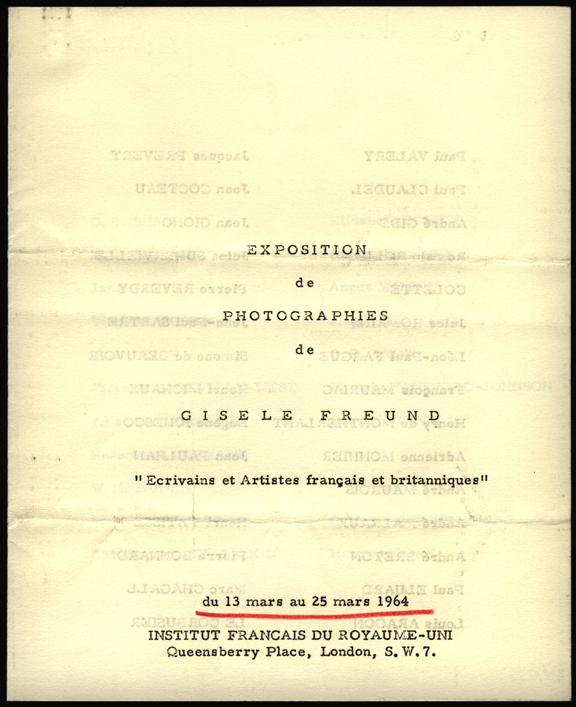 In 1935, Malraux invited Freund to be the official photographer of the First International Congress in Defence of Culture in Paris, attended by André Gide, Henri Barbusse, Aldous Huxley, Boris Pasternak, Alexei Tolstoy, among many others. Verso: "One can see his strange eyes"
Samuel Beckett was an Irish author who lived most of his life in Paris. He was James Joyce's amanuensis during the writing of Finnegans Wake and is known for great modernist plays, including Waiting for Godot. He was awarded the Nobel Prize in Literature in 1969. 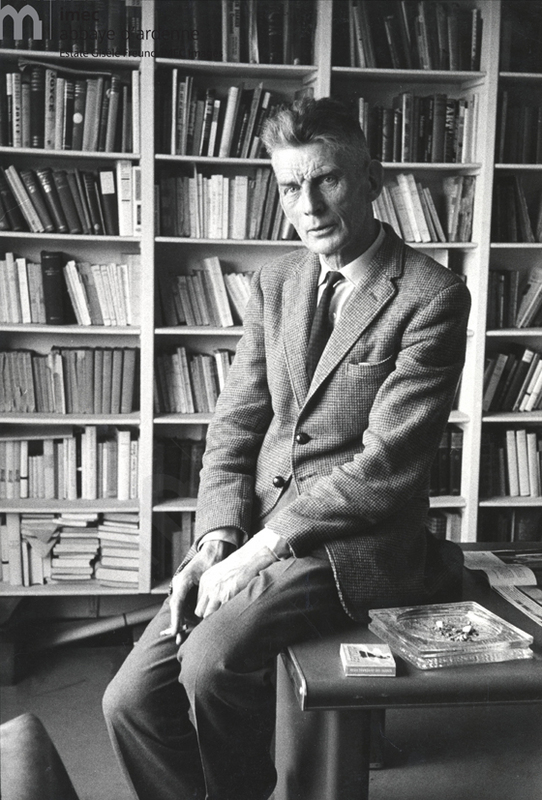 Freund was captivated by Samuel Beckett's gaze. She writes on the back of this photograph, "one sees his strange eyes." 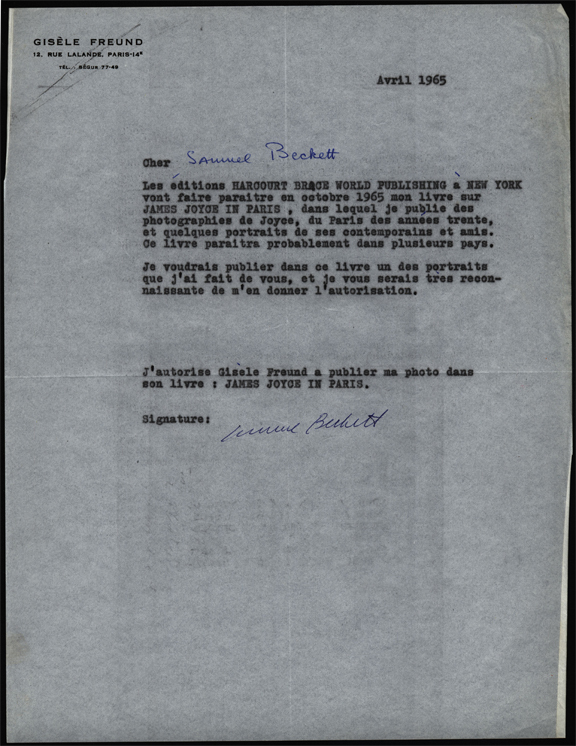 Beckett wrote much of his later work in French, including En attendant Godot. In October 1965, Harcourt Brace World Publishing in New York will publish my book James Joyce in Paris, in which I include photographs of Joyce, Paris, the 1930s, and some selected portraits of his contemporaries and friends. This book will probably be published in multiple countries. I would like to publish in this book the portrait I took of you, I would be grateful if you would give me permission to do so. “I authorize Gisèle Freund to publish my photo in her book, James Joyce in Paris. 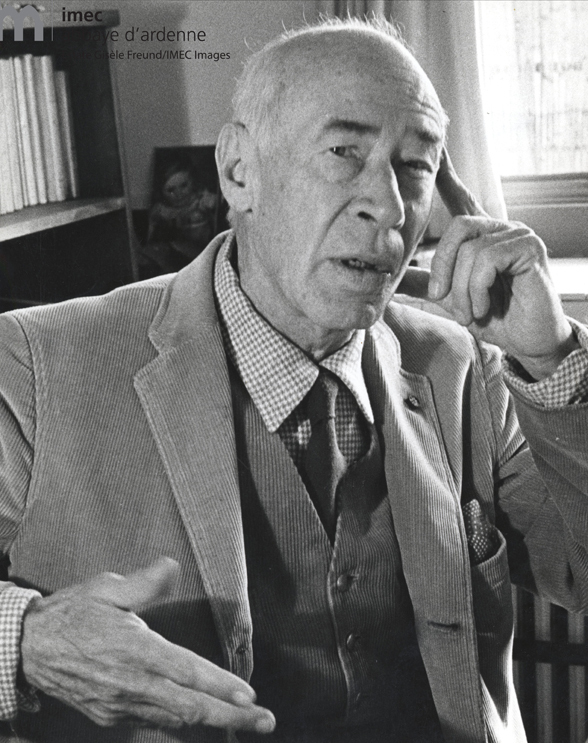 Henry Miller lived in Paris from 1930-1939, where he wrote the famous (but scandalous at the time) Tropic of Cancer. He became a lifelong friend of Lawrence Durrell, whose papers are also housed at the University of Victoria. 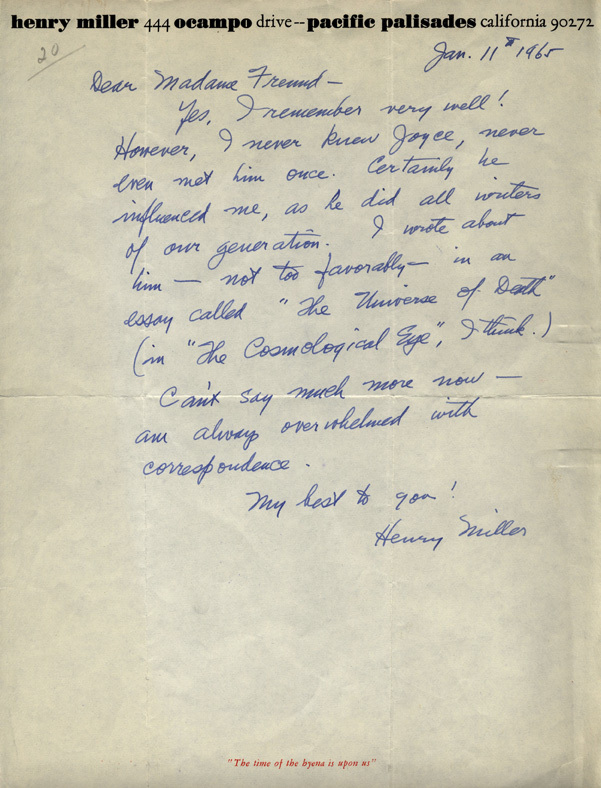 Letter from Henry Miller about Joyce. Can't say much more now– am always overwhelmed with correspondence. Sylvia Beach never made a profit from publishing James Joyce's Ulysses--in fact, she went into debt to bring the masterpiece into the world. After Random House bought the rights to publish Ulysses in the United States for a hefty sum, Joyce simply asked Beach for the copyright, leaving her with nothing. In order to help raise money for Beach's Shakespeare & Co. during difficult economic times, famous authors would give readings to raise money for the bookshop. Here, T. S. Eliot gives a reading in support of Beach. Freund was conflicted about how the book should take shape: should it be just about Joyce, or the Paris scene in general? Here, she asks for her literary agent's advice on what photographs should be included. I just arrived last night from Switzerland and found a letter from your very charming friend Audry inviting me to dinner. Apparently I missed her by only three days. Please tell her how sorry I am. In Zurich, I saw Dr. Gasser, the editor of “DU” which is considered one of the most important literary and art magazines in Europe. (German language) He wants to publish a selection of the Joyce pictures, but as this is a project for next year, there is still time to work out details. Please let me know if you have no objections to Joyce pix published in a magazine in Switzerland. In going through the Joyce pictures once again, I have begun to have serious doubts about including the portraits of Virginia Woolf, Shaw, Wells and other English writers who did not have contact with Joyce while he was in Paris but who were not in Paris themselves. I wonder if you shouldn’t take these out, leaving only T.S. Eliot reading in Sylvia Beach’s bookshop. 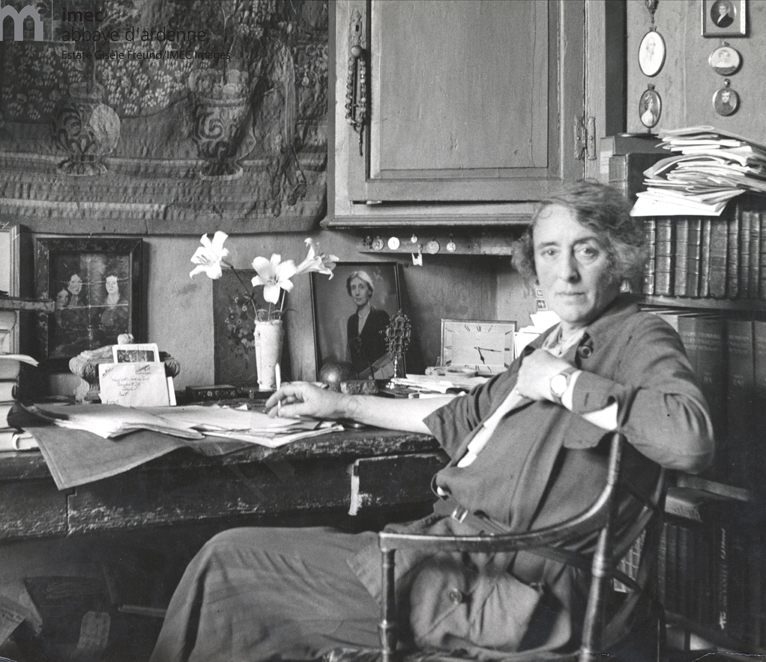 Vita Sackville-West, novelist and poet, was friend and lover of Virginia Woolf, as well as Woolf's inspiration for the novel, Orlando. When Freund travelled, her reputation often preceded her. She photographed great writers on both sides of the channel. 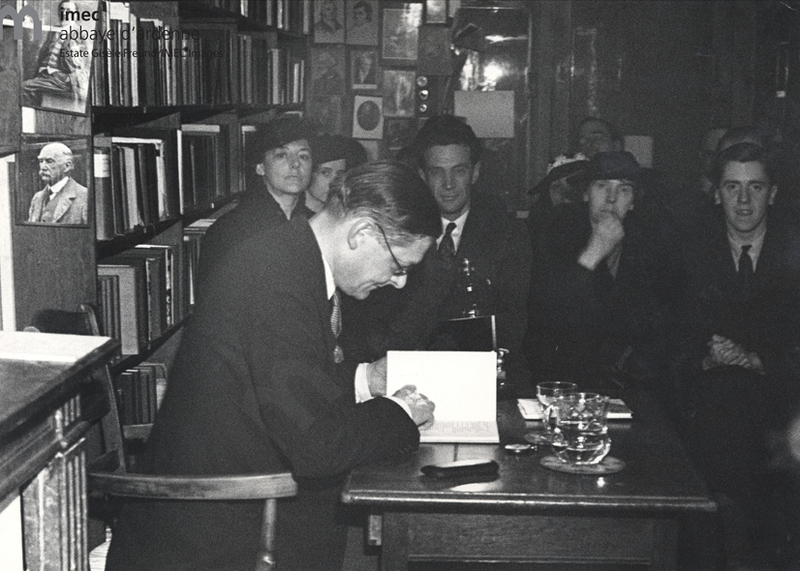 W. H. Auden and Stephen Spender frequented Shakespeare & Co. often. 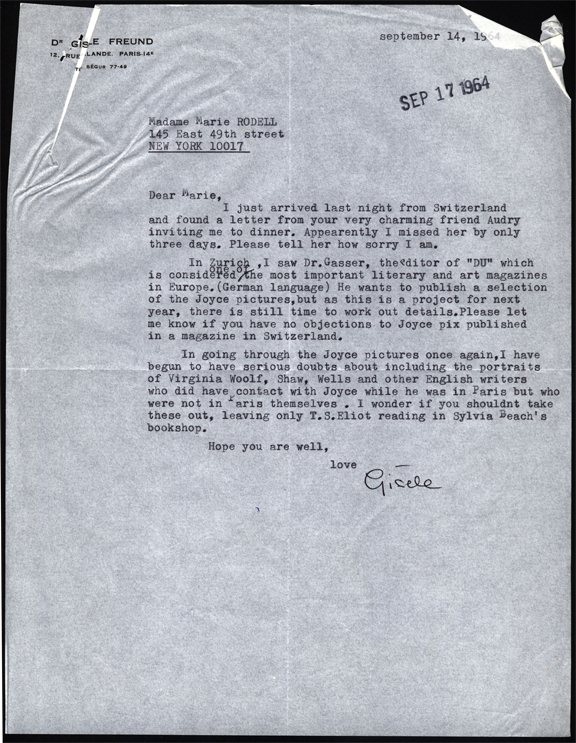 Gisèle visited the two lovers often, and her letters reveal her care in keeping their relationship secret. 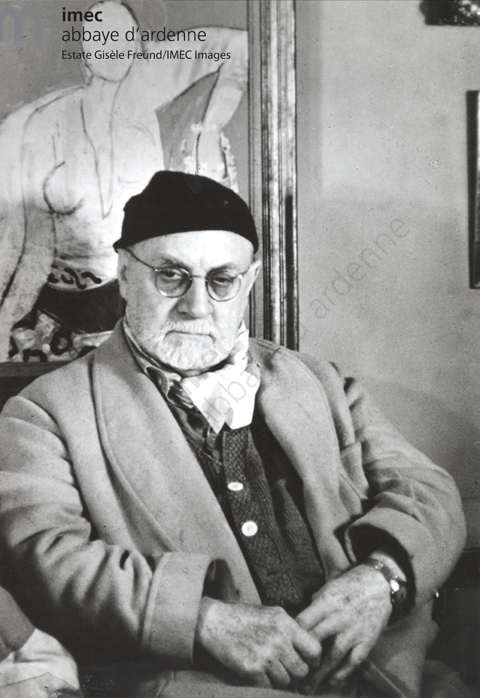 Freund's aperture also caught the eye of many artists, including Henri Matisse, Frida Kahlo, Ernst, among many others. This is a black and white print of a colour photograph Freund shot in 1948. 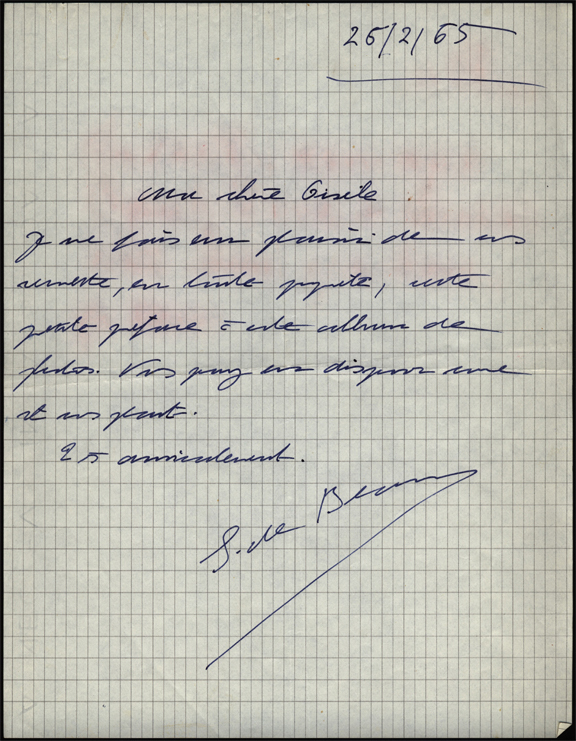 Inscription verso: "to Marie with love, Gisèle"
Freund's photograph of Virginia Woolf is among her most famous shots. Freund visited Leonard and Virginia in their London home before the outbreak of war in England. Woolf was working on her last novel, Between the Acts, a story that takes place between the horrors of the two world wars. 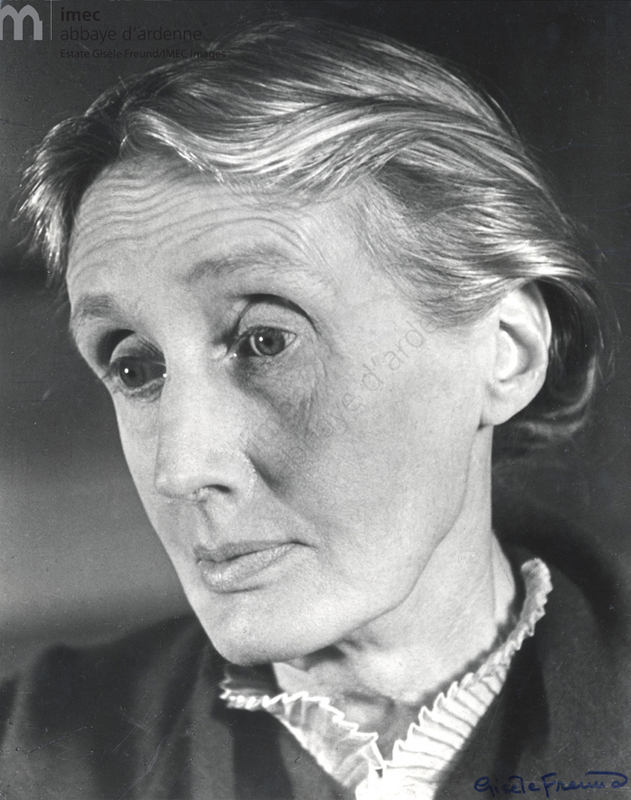 After the outbreak of war and long struggle with mental illness, Woolf drowned herself in 1941. Freund's photograph of Woolf is celebrated around the world and is still used to this day. We have Freund's autographed copy to her agent, Marie Rodell. 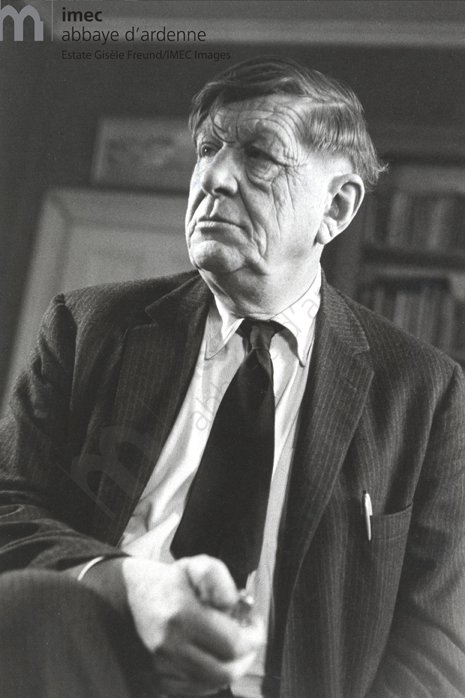 In April 1965, Freund's co-author met with Leonard Woolf in London to discuss James Joyce in Paris. 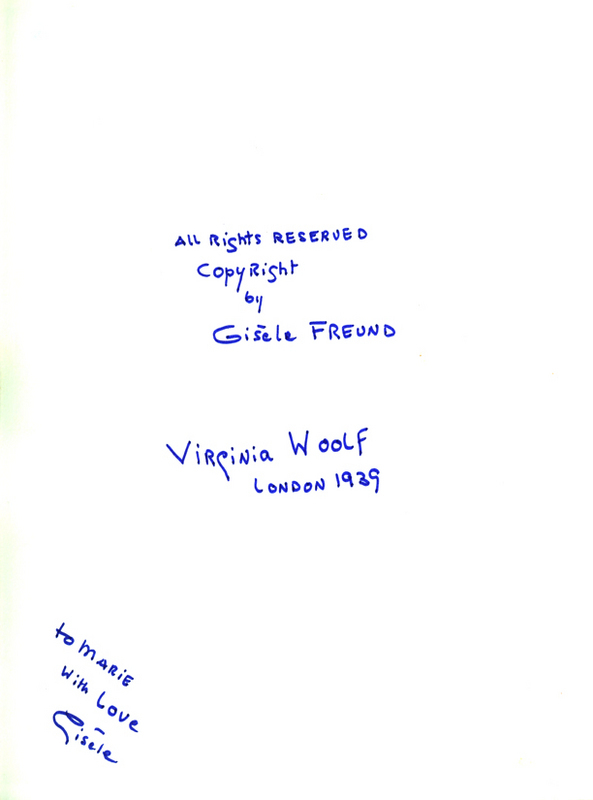 Woolf wrote Freund to give her his consent to use the Woolf photographs. Mrs Carlton came to see me yesterday and I told her that I was quite willing for you to come later on and photograph the garden here. I understand from her that you wished me to agree to your using the photograph of my wife, my dog, and myself in your book on Joyce. I have no objection to you doing this. 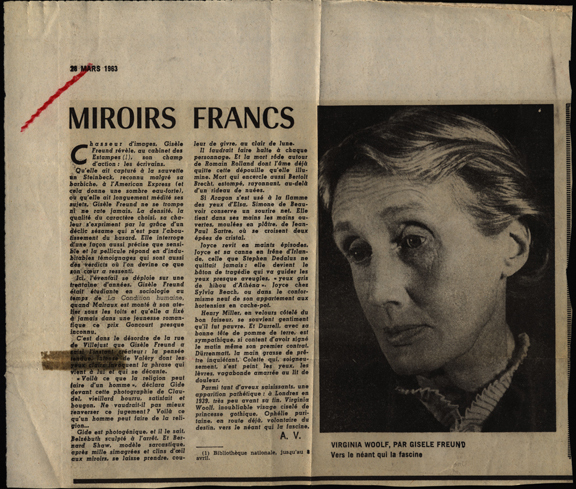 A review of Freund's exhibition in the cabinet des Estampes in the periodical Miroirs Francs. It begins, "Chasseur d’images, Gisèle Freund révèle au cabinet des Estampes, son champ d’action: les écrivans" [A hunter of images, Gisèle Freund reveals, in the cabinet des Estampes, her preferred objects of pursuit: writers]. “Chasseur d’images, Gisèle Freund révèle au cabinet des Estampes, son champ d’action: les écrivans. After the London exhibition of Freund's photographs, the famous English writer and critic, Cyril Connolly, agreed to write the introduction to James Joyce in Paris. 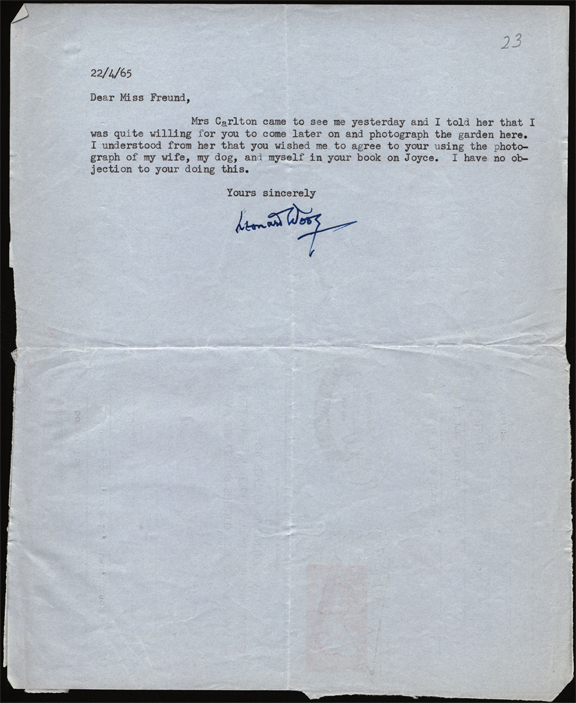 But as the publication date approached, and after many unanswered letters, it became clear that Connolly was not going to come through on his promise. 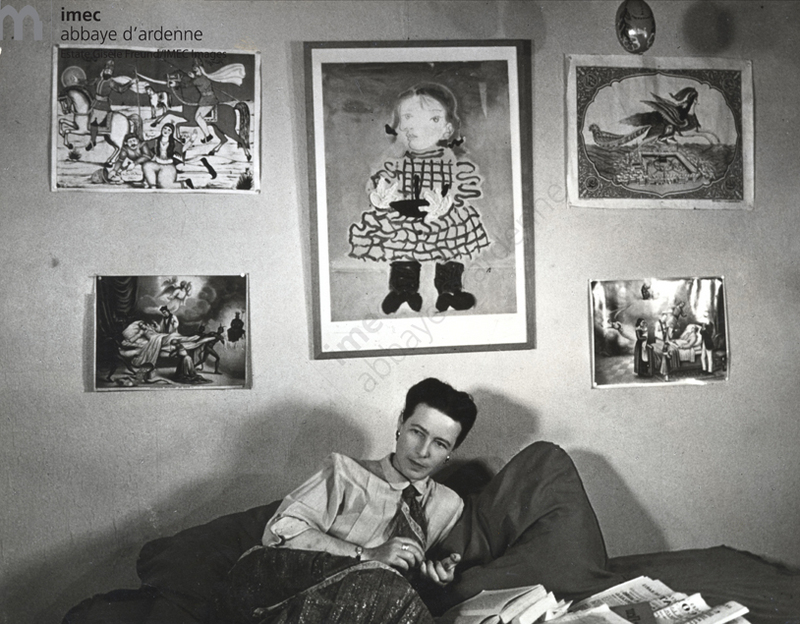 Fortunately, Simone de Beauvoir, Freund's friend and fellow Parisian, wrote a bittersweet introduction to the 1930s, before the outbreak of war. So often of late, while walking through this new Paris of freshly whitened facades where a stream of traffic flows along the road between hedges of parked cars, I find myself pausing to ask: What did all this look like in the days when I was young? How I longed to bring back from memory a picture . . . This desire of mine was suddenly fulfilled when the photographs of Gisèle Freund made during the thirties were placed in my hands. Deserted highways, peaceful riverbanks; an almost provincial silence emanates from these images in black and white. I'm happy to give to you, with full ownership, this little preface for your photographic album. You can do with it as you see fit.